(Mexico City, 1982) Poet and fiction writer. 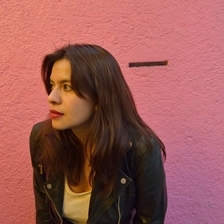 Her book Tránsito (Tierra Adentro, 2011) won the 2012 Carlos Pellicer Ibero-american Award. Named “emerging writer of the year” by La Tempestad magazine in 2011. She won the 2016 Gilberto Owen National Literature Prize for the poetry book Ya sabes que no veo de noche. She has received grants via the FONCA Young Artists’ Programme on three occasions.